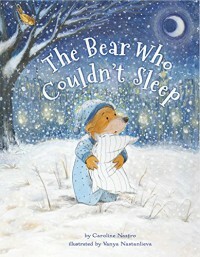 It's winter and despite his mother and brothers sleep, Bear can't sleep. He watches the leaves fall, and the snow to cover everything, but he still can't sleep. He decides to look for someone to make him company, but all his neighbors are sleeping too. He walks, and walks until he arrives to the city that never sleeps, and that's is exactly what he needs! He visits museums and famous landscapes. He meets people and eats delicious food. He also gets sleepy... So he tries to sleep in a bus stop bench, in a corner at the museum and even in Central Park, but he can't. He comes back to snuggle with his mother and brothers to wait, eyes closed, for he spring to come. Lovely illustrated bedtime story for those days when kids have lots of energy left and don't want to sleep. The book's pace slows down a little more each page, and at the end you fell like curl up among the bears to sleep. Another great addition to our bedtime collection.